Modern editions – an online edition by Clemens Goldberg is available at the Goldberg Stiftung. Scholarly literature (selection) – Droz 1927; Jeppesen 1927; Bush 1940; Gutiérrez-Denhoff 1984; Gutiérrez-Denhoff 1985; Higgins 1987; Goldberg 1997; Alden 1999; Alden 2010 - especially the very detailed description in Appendix A (A1 – PDF). Parchment chansonnier of very small format, c. 12,5 x 9 cm, 151 folios (of original 166), two sets of flyleaves; original soft parchment binding; 20 fascicles of original 21, labelled “a”–“x” (collation labels), “t” is missing; original roman foliation and a sporadic modern Arabic foliation (see below); ruling (staves and margins), text and music in brown/black ink now faded to different degrees; 7 staves made with ruler per page, two types of page arrangement: 1) with ruling of margins resembling an “H” with two cross bars (fasc. 1–10 and 18), 2) with the vertical and horizontal margins crossing each other at the corners (fasc. 0, 11–17 and 19); index added by the Dijon scribe in a separate fascicle (ff. 2-6) and later supplemented by a later hand (index scribe II – see below); illuminated initials in full colour and monochrome appear in fasc. 1–13 and 18 in three clearly discernable styles (see below); the remainder of the pages have only empty spaces left for initials; fasc. 24-26 contained from the start blank, ruled pages only – as extra space for musical additions. The original contents were at least 110 songs (four have disappeared). The Laborde scribe (the original scribe) copied 60, all without any composer attributions; the second scribe (LabordeB), who is identical with the main scribe of the Dijon chansonnier, expanded the chansonnier and added 26 songs with in all three attributions and the index; two later scribes, LabordeC and LabordeD together added 14 songs without attributions, while the index scribes II and III, who probably worked in the same workshop, updated the index (see below) and contributed 12 composer names, primarily above songs copied by the Laborde scribe; a later hand, LabordeE entered nine songs with four attributions. The index (ff. 2–6) was made by the Dijon Scribe in a separate fascicle ruled in two columns and added at the start of the volume. It is semi-alphabetical, with the songs grouped under the appropriate letter, thereafter in order of occurrence, and they have references to the folio numbers. The index is visually made clear by the use of alternating blue and red colors in the capitals and alternating black and red ink in the song titles and folio references; the titles added by Index scribes II and III are all in black. The Dijon scribe foliated fascicles 1-16 (ff. 8-127v) as ff. i-Cxxvii in pale red ink in the upper right corner; much of his foliation was cut away by the later trimming of the pages. His foliation did not include the first page of fasc. 1, which already had been removed, but included the other missing pages in fasc. 2, 3 and 8. Therefore his foliation and the modern foliation, which includes the flyleaves and fasc. 0, match each other from f. 51 onwards. The index provides initial letters for 150 songs. Of these the Dijon scribe supplied titles and references for 84 songs entered into the MS by himself and the Laborde scribe in fasc. 1-13 plus the four-part songs “Soubz les branches / Jolie mois / En la rousee” and “Tart ara”, entered by the Laborde scribe into the now lost fasc. 17a and in fasc. 18 – these last entries miss the folio references. Later 13 titles entered by hands LabordeC and LabordeD were added to the index, 12 by index scribe II and one by scribe III, making a total of 98 pieces, of which four (nos. 8a, 13a, 13b and 95a) have disappeared. The index also omits the textless no. 78 “O dieu d’amours” (Hand LabordeB) and the incomplete no. 94 “Mais que se fust secretement” (LabordeD), but also no. 96 “Garison sçay / Je suis mire” (the Laborde scribe) and no. 96 “Je n’ay dueil que je ne suis morte” (LabordeC) are absent like, of course, all the entries by hand LabordeE (nos. 97-98 and 100-106). Fasc. 0, ff. 2-7v – index added by the Dijon scribe (LabordeB). Fasc. 1, ff. 8-14v - the first folium is missing, which leaves the opening motet, Frye’s »Ave regina celorum«, incomplete. Fasc. 1-9 are copied by the Laborde scribe. Fasc. 2, ff. 15-20v – the central bifolium is missing. This causes the loss of Du Fay’s »Le serviteur«, which according to the index occupied the central opening (no. 8a). Moreover, the loss has left two songs incomplete, Joye’s »Non pas que je veille penser« (no. 8) and Binchois’ »Comme femme desconfortee« (no. 9). Fasc. 3, ff. 21-24v – the central bifolium and two single folios are missing between ff. 21 and 22. This makes no. 13 »De m’esjouir« and the unique »Je n’ay povoir« (no. 14) incomplete, and two songs mentioned in the index have disappeared, nos. 13a-b »Ce qu’on fait a catimini« and »Le jolis tetin«. Fasc. 8, ff. 56-63v – one folium is missing between ff. 50 and 51. This makes no. 39 »Esse bien fait« and no. 40 » Soyes apratiz« incomplete. The Laborde scribe left the last pages of the fascicle and the front page of the following empty. These pages have been filled by the Dijon scribe (LabordeB) with nos. 48-50. Fasc. 10, ff. 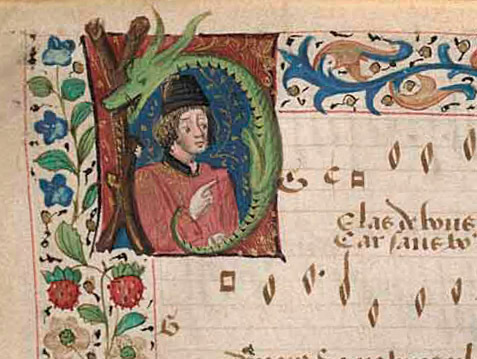 72-79v – the Laborde scribe used the front page only for the lower voices of no. 58. The remainder and fasc. 11-13 were filled out by the Dijon scribe (nos. 59-81). Fasc. 11, ff. 80-87v – fasc. 11-17 and 19 were added by the Dijon scribe (LabordeB) who also filled fasc. 11-13. Fasc. 13, ff. 96-103v – the Dijon scribe left the last five pages as well as the remaining fascicles not used by the Laborde scribe with empty staves only. The empty pages in fac. 13 were filled by hand LabordeC. Fasc. 14, ff. 104-111v - originally empty staves only, later filled by hands LabordeC and D.
Fasc. 15, ff. 112-119v – originally empty staves only; later filled by hand LabordeD. Fasc. 16, ff. 120-127v – the scribe LabordeC entered Ockeghem’s four-part »Je n’ay dueil que je ne suis morte« on the first opening (no. 95); the remainder of the fascicle contains empty staves only. Fasc. 17, ff. 128-135v – empty staves only. (Fasc. 17a - lost. According to the index it contained the four-part “Soubz les branches / Jolie mois / En la rousee” (no. 95a), probably copied by the Laborde scribe like the following no. 96). Fasc. 18, ff. 136-142v – the first folium is missing. It contained voices for the four-part no. 96 »Garison scay / Je suis mire«, of which only the two contratenors for the second section remain in the MS, copied the Laborde scribe. The anonymous song began on the last page of the missing fasc. 17a. The Laborde scribe also entered the four-part rondeau, in other sources attributed to Molinet, »Tart ara mon cueur sa plaisance« on the opening ff. 138v-139 (no. 99); the remainder of the fascicle was filled by hand LabordeE. Fasc. 19, ff. 143-150v – originally empty staves only, used by hand Laborde E who left the last two openings empty. Style A (fasc. 1-9 plus the first page of fasc. 10 and the two songs in fasc. 18 entered by the Laborde scribe) features historiated initials and illuminated borders with flowers, berries and grotesque figures on a white background (two borders on black background appear on ff. 8 and 138v); maybe the initials were made by more than one cooperating book painter: 1) with portrait-like figures and angels supplemented by or consisting of dragons and other fabulous beings in full colour (in fasc. 1-3, 6-10 and 18, see figure 1a); 2) with figures painted in monochrome grisaille (on brown, blue or red ground, in fasc. 3, 6-7 and 9, figure 1b); 3) with letters in gold combined with portraits in subdued colours (in fasc. 4-5 ,figure. 1c). Style B (fasc. 10-11), monochrome letters and foliate border patters in dark colours, black, grey, blue, ochre, brown and red, with highlights in the same colours (see figure 2). Style C (fasc. 12-13), the painter has designed elegant letters combined with full colour portraits in the style of Jean Colombe; incomplete, no borders has been painted and the spaces for initials for the contratenor parts have been left empty (see figure 3). Full borders surrounding the writing space are found on the left-hand pages of the first openings in fasc. 1–10 – even in the middle of a piece, where it bridges two fascicles. 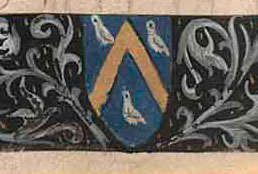 The painter of style B incorporated a coat of arms in his full border around the text and music on f. 72v (see figure 4), and he added the same coat of arms to the borders painted in style A on ff. 25v, 33v and 56v. 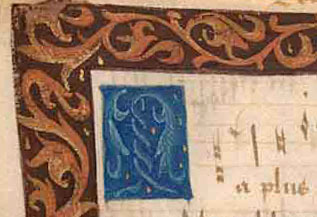 Jane Alden has described the coat of arms as “depicting a gold chevron with three silver merlettes on an azure background (d’azur, au chevron d’or, accompagné de trois merlettes d’argent, deux et un)” (Alden 1999 p. 48). 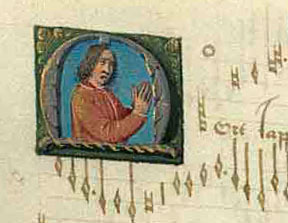 On the first surviving page of music (f. 8) a horizontal blue border has been added in the bottom margin, which contains the letters “M” and “I/J” in gold around a variant of the coats of arms, which artist B had painted at an earlier date. The genesis of the MS has been extensively researched by Jane Alden (see the detailed report in Alden 2010, especially pp. 73-93, and her dissertation, Alden 1999). The MS was surely planned as a delicate chansonnier in very small format of 12 fascicles (fasc. 1-10 plus fasc. 17a-18 containing four-part pieces), and it was commissioned by a wealthy patron. However, its final shape was determined by a series of events, which only can be described as disasters in the field of 15th century book production. The original scribe planned, collected and ordered the repertory for ten fascicles of three-part music and two of four-part sings. He nearly finished the copying, a work of some months, and then he suddenly went out of business, died or went away. The project in the form of loose, undecorated fascicles were handed over to the Dijon scribe, who apparently was the owner of a flourishing workshop producing this sort of chansonniers (see further the Dijon chansonnier). He quickly finished the book according to the original plan by supplying the missing three songs in fasc. 8-9, but leaving empty most of fasc. 10 and 18. The fascicles were sent to the painters for decoration according to the customer’s wishes. Apparently this was a hurried process because several painters worked together to finish the job, and the initials in fasc. 5-6 appear to have been farmed out to a subcontractor before the painting of the borders. When the decorated fascicles were returned to the Dijon scribe, the next disaster occurred. The customer did not receive the ordered chansonnier. He may have died or fallen out of grace and was unable to pay for the last stage of the work done. The scribe probably had not received prepayment in full for all the expenses and now had to find a new customer. Just like he did in the case of his own stalled chansonnier project he decided to expand the MS. Between fasc. 1-10 and the original fasc. 11-12 (17a-18) and at the end he added eight new fascicles (11-17 and 19) ruled in a slightly different way (see above). He removed the first page containing music, Frye’s “Ave regina celorum”, which probably identified the original customer as the owner of the MS, he entered 26 new songs, and added a small fascicle at the start containing an index – and in the same process foliated the relevant pages. There was lots of space for the addition of more songs, on the pages as well as in the index, but now he had found a new patron. This customer wanted it decorated and his arms added throughout the MS. This time too, it was an urgent matter. The first 11 fascicles were sent to the atelier working in style B. There decorations were added to fasc. 10-11 and the new owner’s coats of arms on the fascicles already decorated (on ff. 25v, 33v and 56v, and in fasc. 10 on f. 72v). Meanwhile another atelier decorated the written pages in fasc. 12-13 in style C. The Dijon scribe probably had planned to replace the missing first folio with “Ave regina” with a new one identifying the new owner. But before that, the flow of money apparent dried up again. The fascicles 12-13 were returned from the painter unfinished and laid aside with the other fascicles again waiting for a customer. Unbound and unfinished the Laborde chansonnier remained in the possession of the Dijon scribe alongside his own project, the likewise very big and unfinished Dijon chansonnier. Apparently the demand for extended chansonniers was less than he had reckoned with. When the Dijon scribe went out of business some time later, both chansonniers passed to the workshop of the scribe of Florence 2794 and his successors, a workshop with close connections with the French court chapel. Here the hands LabordeC and LabordeD added five and nine songs respectively, and other hands supplemented the index and foliation (index scribes II and III), and the MS was bound between simple soft parchment covers. The scribe LabordeC can be identified as the main scribe of Florence 2794 (see further Christoffersen 2012). From this workshop it probably went to its first owner and user. 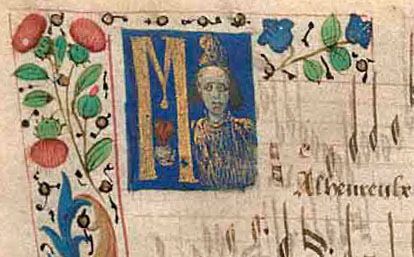 This person may have been related to the patron of the Dijon scribe who wanted his coat of arms painted into the MS, since the coat of arms, which was added in the bottom margin along with the letters “M” and “I/J”, seems to be a variation of the first one. The songs entered by hand LabordeE may have added during the next decades. For convenience the various stages or copying layers in the development of the Laborde chansonnier in the literature have been labelled according to the music hands involved: Laborde 1, the Laborde scribe (hand LabordeA – 60 songs); Laborde 2, the Dijon scribe (LabordeB – 26 songs); Laborde 3, LabordeC and D (14 songs); Laborde 4, LabordeE (9 songs). 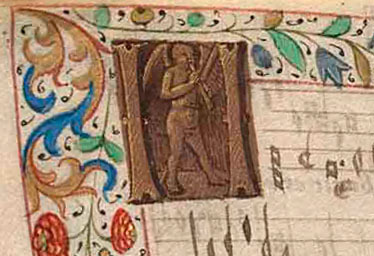 The chansonnier does contain a lot of later inscriptions, but none which can help to identify the original owner. On the front flyleaf (f. 1) we find an inscription in a large late 15th- or early 16th-century hand “Par tout passe fumee”, and at the back of the MS (on f. 150) a very faded inscription is dated February 3, 1503, which seems include the name “Fumee”. The Fumee-family of Tours was influential and had high positions at and close connections with the French court (see further Alden 2010, pp. 206-210). For detailed information on the MS’ copying, decoration, inscriptions and recent history, see Alden 2010, Appendix A1. The original plan for the chansonnier and the copying work performed by the main Laborde scribe (Laborde 1) can with some assurance be dated 1470-1471 based on the appearance of the chansons by Philippe Basiron, cf. my article ‘The chansons of Basiron’s youth and the dating of the ‘Loire Valley’ chansonniers’. The preliminary analysis of the repertories of the Wolfenbüttel and Laborde chansonniers on this site furthermore shows that the Wolfenbüttel scribe and the original Laborde scribe were contemporaries, working in the same area and often used similar or identical exemplars for their copying. How much time went by after the demise of the Laborde scribe and the Dijon scribe’s taking charge of the project is impossible to say. But the urgency, with which he seems to have completed it and sent the fascicles out for decoration, may indicate that it too happened within the same timescale. Then the project suffered a new standstill, while the Dijon scribe expanded it to nearly double size and looked for a new customer. He had already made a similar expansion of his own chansonnier project, and apparently had not yet lost hope of a successful marketing of such big chansonniers. A new patron was found, decorations ordered and nearly finished. Tentatively we can presume this happening during the period 1472-74 (Laborde 2). The commercial transaction with the new patron failed, and the unfinished and unbound MS remained in possession of the Dijon scribe for some years. Together with the other unfinished big chansonnier it finally was handed over to a new workshop, that of the scribe of Florence 2794. Here both manuscripts were quickly finished and bound and both of them dispatched to owners – presumably at a discount price. This part of their early history may be placed in the years 1477-79 (Laborde 3 – cf. my article ‘The French musical manuscript in Florence, Biblioteca Riccardiana, Ms. 2794, and the ‘Loire Valley’ chansonniers’). Datings in the musicological literature: Jeppesen 1927, Laborde 2 1470-1480, Laborde 1 1480-1490; Bush 1940, Laborde 1 c. 1475, Laborde 2 before 1485, Laborde 3-4 16th century; Perkins 1979, Laborde 1-2 early or mid 1470s, Laborde 3-4 1480s or early 1490s; Gutiérrez-Denhoff 1985, Laborde 1 c. 1460-1467, Laborde 2 c. 1467-1475, Laborde 3 1485-1495, Laborde 4 c. 1495-1520; Alden 2010, Laborde 1 and 2 c. 1467-1470s, Laborde 3 1480s, Laborde 4 1490s.